Inventor Of Computer Mouse Dies; Doug Engelbart Was 88 : The Two-Way U.S. inventor and Doug Engelbart, the man known as the father of the computer mouse and a thinker who helped introduce other key innovations, died Wednesday morning at age 88. His death was announced today by the Computer History Museum. 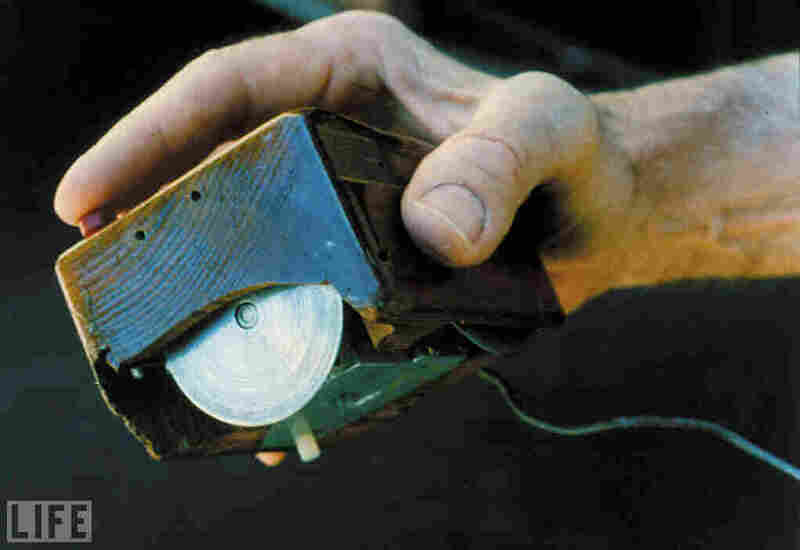 This early version of the mouse (named for its tail-like cord) was assembled by Douglas Engelbart and his Stanford team in 1963. U.S. inventor Doug Engelbart, the man known as the father of the computer mouse and a thinker who helped introduce other key innovations, died Wednesday morning at age 88. His death was announced today by the Computer History Museum. A scientist and engineer who devoted himself to find ways to use computers to improve people's lives, Engelbart developed his idea of Collective IQ — which also became the name of a blog he ran with his daughter, Christine — to describe what he called "a measure of how effective people are at addressing complex, urgent challenges collectively." The Computer History Museum summed up that idea in citing another quote from the late innovator: "The better we get at getting better, the faster we will get better." The idea was also one he promoted with the Bootstrap Institute, an organization he founded in 1990 that was later renamed the Doug Engelbart Institute. As NPR reported back in 2009, for two decades, Engelbart was also part of the famed Stanford Research Institute in Menlo Park, where his work saw him play a part in the development of ARPANET, the network that helped set the framework for the Internet. In a video from 1968, Engelbart demonstrated the capabilities of not only the mouse — a rudimentary, two-wheeled device in those days — but also of the power of networked computing. Titled "A Research Center for Augmenting Human Intellect," the presentation gained a more informal name over the years: "The Mother of All Demos." In the demonstration, Engelbart ran through concepts and practices that are common today, including "hypertext, shared screen collaboration, multiple windows, on-screen video teleconferencing, and the mouse as an input device," the Computer History Museum says. "This demo embodied Engelbart's lifelong commitment to solving humanity's urgent problems by using computers as tools to improve communication and collaboration between people," according to the museum. In 2000, he was awarded the National Medal of Technology.